In a time long ago, when your grandmother’s great-grandmother was just a little girl, another little girl named Clara Stahlbaum waits anxiously for her parents to let her catch a glimpse of their magnificent Christmas tree with a golden angel placed on top. Made to sit in the foyer with her pesky little brother Fritz, Clara waits for so long, she falls asleep. It is Christmas Eve. The Stahlbaums are hosting a celebration for family and friends in their grand New England country home. The house is beautiful, brimming with antique furniture brought to America from Germany. Elegant silhouettes adorn the walls and a grand portrait of Clara hangs over the mantle. Fritz’s collection of tiny soldiers and cannons is on proud display in the tall cabinet. The fire in the hearth is warm, the moon bright, and the snow outside as thick as a wool blanket. The towering Christmas tree is absolutely magical. Dr. Stahlbaum leads the Fathers’ Dance, while Mrs. Stahlbaum offers delicious Spanish chocolates and marzipan candies to the children and champagne to the grown-ups. Soon Clara’s grandparents arrive with her cousins and at the stroke of eight, her dear godfather Drosselmeier makes a dramatic entrance. With him is his handsome nephew Nathaniel, whom Clara has never met. 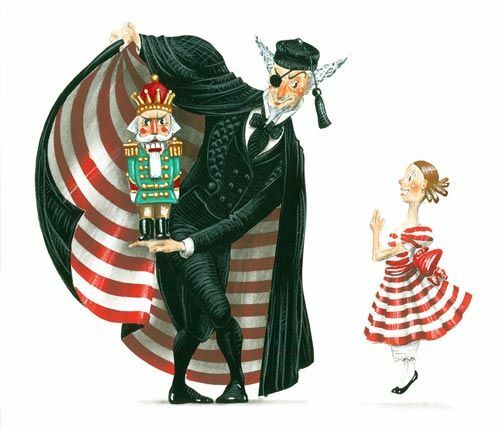 Drosselmeier brings life-like dancing dolls, a charming hobby horse, beguiling magic tricks and, best of all, a gallant wooden Nutcracker, which Clara loves instantly. Nathaniel presents Clara with a precious toy bed for her new Nutcracker. As night falls, Clara must bid farewell to her friends and wonders if she will ever see Nathaniel again. Unable to sleep, she returns to the parlor to collect her beloved Nutcracker. Curling up on the chaise, she finally drifts off to sleep. Suddenly Clara sits up. She hears something. Did she see something? Is Drosselmeier still there? Is she dreaming? Just then, a chubby mouse twice Clara’s size trundles across the parlor floor and then another and another with baby mice, too. What should Clara do? Everything in the parlor begins to grow. The clock looms, the chaise is enormous, and the window is as big as the house. The tree is so tall, Clara can no longer see the golden angel on top. Even her Nutcracker on his bed is now life-size. Soon Fritz’s legion of toy soldiers comes to life led by a sentry, a trumpeter, and a bunny with a drum. A raging battle ensues between the mice and the soldiers until a seven-headed Mouse King takes center stage. Suddenly Clara’s Nutcracker arrives to defend her. Clara hurls her slipper at the seven-headed mouse. Breathless, she faints, collapsing on the little bed. In the end, her brave Nutcracker defeats the Mouse King, chopping off one of his seven crowns. The triumphant Nutcracker leads Clara through a magical forest where snowflakes swirl and dance around them. An ancient spell is broken and before our eyes, the Nutcracker becomes a handsome Prince, who looks just like young Nathaniel. After he places the golden crown on Clara’s head, they follow a brilliant Christmas star to a faraway land. Clara and the Prince sail into the Land of Sweets on a boat made from the shell of a walnut. The Sugar Plum Fairy welcomes them, surrounded by a dozen golden angels. She asks the Prince to tell the story of his heroic battle with the Mouse King. The Sugar Plum Fairy and all her court are impressed by the Prince’s bravery. The Sugar Plum Fairy introduces Clara and the Prince to dancers from distant lands. Each represents something delicious! There are Spanish chocolates just like Clara’s mother serves, exotic coffee from Arabia, tea from China, candy canes from Russia, and German marzipan in an array of vibrant colors. Charming Mother Ginger and her eight tiny polichinelles are from France. Clara and the Prince are entertained by each treat while they sample scrumptious sweets and tasty puddings. After a brilliant Waltz of the Flowers led by a pristine Dewdrop, the Sugar Plum Fairy and her Cavalier perform a grand pas de deux. Now the time has come for Clara to return home to her new Nutcracker. As the Sugar Plum Fairy and all her court wave goodbye, Clara and the Prince take flight in an enchanted sleigh pulled by reindeer. Clara will never forget her most magical dream. 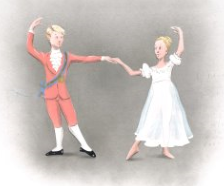 Learn more about George Balanchine’s The Nutcracker®.